I’m just back from Budapest from a 10 day coach education course for sabre coaches. It’s been an interesting experience, both in terms of the fencing and the culture and is one that I would recommend for any coach that has the opportunity to attend. You may be surprised (or not) to find that the FIE provide very few details for the course, beyond it’s existance. The only information Nathaniel Lewis (fellow Brit attendee) and I were given were the dates and the name of the course tutor. That was it. As such, the following may prove helpful for any future attendees of the course so they know what to expect. Flying out proved an interesting experience. My experiences of travelling alone, with or without fencing kit are relatively well documented, so I tend to allow plenty of time to get through check-in and security. True to form, I was taken aside on the way through security, searched and asked a dozen questions, some of which I had some difficulty answering (a letter from the FIE might have helped here). Out the other side of security, the flight itself was pleasant enough and baggage collection at Budapest was a breeze. I was greeted by one of a driver holding a card labelled “FIE”. We met a few other coaches and the first question I was asked by another delegate was “do you know Stuart Marshall?”. It’s a small world. It’s about a 30 minute drive from the airport to the “Sport Hotel”, and a meal of meat and potatoes was waiting for us on arrival. This was an admittedly welcome meal, but it’s worth noting that despite having a quite serious allergy, it’s up to yourself to manage this and find alternative food if you can’t eat the meal served. Meals are served three times a day, with a hot lunch and dinner. There are a few shops locally and a McDonalds within easy walking distance. I have no idea how vegetarians, etc were handled. Accommodation is on a twin room basis, each room is generously sized with a en-suite, TV and balcony. The TV has a standard HDMI port, if you want to plug your own devices in. The rooms are approximately 25m away from the salle. Let me repeat that, you can crawl from your bed to the piste. I like. The FIE have done a good job in covering almost every expense on the trip. Board and food is provided, and after the second day, you’re given a metro card which gives you free travel on public transport. The excursions are done by coach, and any group meal is covered. All you need to take is money for souvenirs, the occasional meal you fancy taking away from the hotel and beer. Bear in mind the PBT shop is about a ten minute walk away. The salle itself is the size of a few badminton courts. It suits foilists more than saburers, as the pistes are a little short, but the floor is modern rubber and all pistes are equipped with overhead bungee cables. It’s a great place for coach education, and most of us secretly wanted one at home. As an aside, we ended up visiting three permanent salles whilst we were here, two small and one huge. There was a small amount of salle envy, even for the small ones. Do not be fooled by the early pace of the course. By the end of day one, or day two you may be wondering when the real work is coming. Enjoy these early quiet days to get to know the other people on the course, you’ll be begging for them by the end of the course. Course materials are provided in the form of a thick booklet containing lesson plans, white papers and a biography of LÃ¡szlÃ³ Szepesi. Whilst the background information is interesting to read, it’s worth getting ahead and getting to grips with the “five lesson” plans you’ll be studying over the next ten days. There is also a book available for purchase on coaching in groups, which some of the early course content comes from. I may have forgotten to pick up a copy. I’ll be fixing that. Day one consists of an easy start with a sit-down session where we’re introduced to the FIE representative, Master Laszlo Szespsi, and given an overview of the purpose of the course, the FIE’s motivation for the course, and a brief overview of the course contents. With that out of the way the afternoon consists of stretching, games and pair work exercises. Day two starts where day one left off. Pair work exercises without weapon in hand and some absolute chaos with tennis balls. All good fun, all serving a purpose. By the afternoon of day 2, you’ll have moved on to the start of the “five lesson” plans, doing some introductory exercises with thrusts. These plans make up the bulk of the work for the remainder of the course. Lots of fuss is made over Szepsi’s “five lesson” plans, as his rigid schema for lesson planning. I think there’s more flexibility in here than people give him credit for. He explained on the last day that the idea for the five lessons came from an exchange program between French and Hungarian coaches. The coaches would spend a few weeks working in the other country learning the other system, but on returning would immediately forget what they had been taught and revert to their existing system. Much like you would in academia, documenting taught lessons was an important part of retaining the knowledge. The five lesson plan is a framework of fencer education that you can use to progress your own students. Religious adhesion to the letter of the lesson is not necessary. The course starts quite easy, but by the end of day nine exercises are coming at quite a pace. To avoid suffering the same fate as the coaches in the story above, video and document everything you can. I have hours and hours of footage that I’ve stored in a private list on Youtube. If you want to have access to it, ask very nicely. Nat and I both worked on a process by which we would attend the morning or afternoon session, record everything possible, then return to the room, write up our own personal notes and review/upload the footage. This record, review, repeat system has really helped in retaining as much of the information as possible, but you’ll have to find your own system. The important bit is to record and document, as best you can. Review it when you can get some space. It’s worth noting that not everything learnt on this course can be used verbatim back in Blighty. Our health and safety requirements are significantly stricter than those in Hungary, although at no point are you left feeling there is any risk to a student by poor practice. Most exercises can be easily adapted by the addition of a few pieces of equipment, with the exception of the infamous brown trouser lesson. Nandy kept his hair this time. 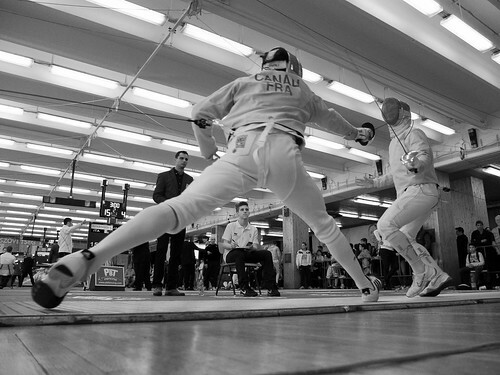 You’re expected to perform the role of coach and fencer during sessions and the sessions can be quite demanding. Enough fitness to manage a warm-up, footwork and take a series of exercises over a few hours is a must. On the first few days, most people performed both roles in coaching jackets, but by the end most of us were zipping in and out of them as quick as we could if we were playing the fencer. You will get things wrong. As both coach and fencer. This is fine. Accept you’re going to make mistakes and learn from the experience. Whether it’s odd blade presentation or an inability to take two steps back without doing a cross-over, mistakes will happen. Szepesi may get occasionally frustrated and start tapping his blade on the floor, or cursing at you in French or Hungarian, but that’s all part of the process. Language was an interesting component. The FIE do state that the course will be delivered in English. This is a small lie. The course is delivered in Hungarian, and then translated in to English, and the job that Kritinza and Nandy performed can not be praised highly enough. We had a few non-English speakers, which meant that for some of the content, the course was delivered in Hungarian, translated in to English and then translated again in to Russian. That made for some interesting, and mildly entertaining interpretations of the lessons. This aside, all coaches worked hard and managed to comprehend the material, despite the language barrier. Unlike previous courses, there is no formal assessment at the end. You’re assessed in an ongoing manner over the duration of the course, and you’re given the opportunity to put your newly learned skills in to practice at two evening sessions as Szepesi’s club. The club is small, but pleasant, with five pistes and Olympic posters adorning every wall. And … something mildly embarrassing on one of the walls. We didn’t ask why, not sure we wanted to know the answer. Students range from beginners with a single year’s experience to a European cadet champion. Typically, for one session you’ll be given one of the cadets, and for another one of the younger kids. You’re expected to deliver a 20 minute lesson of an appropriate level, from the five lesson plans. Feel free to refer to the notes. Often. The social aspects of the course are not ignored, and Friday afternoon through to Sunday are given for recreational time. Friday afternoon was a group visit to the Rudas Turkish Baths, which was an experience the Brits will never forget. Saturday was a trip to the Budapest Junior Sabre World Cup, and a visit to the biggest dedicated salle I have ever seen. Sunday we visited the Margit KovÃ¡cs museum in Szentendre, had a wander around the town and a very pleasant lunch. During the week, we organised a few outings ourselves. Nat and I went for a wander around Budapest, where we ended up part of a viral campaign for Stabilo. There were a few unsanctioned nights out for the purposes of “bonding”. I may have fallen in love with ruin pubs, and think one would suit Manchester’s Northern Quarter very well. These kind of opportunities do not occur often. Apart from the diploma, material has been learnt and friends have been made. I suspect that the FIE’s objectives move beyond the coaching and extend to building a community of coaches that communicate with each other. In this case, they’ve definitely succeeded. The FIE are keen to continue these courses, and they provide an experience you simply can not get within the UK. I hope that when the next course opens, any coach reading this feels encouraged to apply and get a near unrepeatable experience. Make sure you take a full compliment of coaching kit. One coach failed to arrive with any kit, due to miscommunication. If you still fence, bring your whites and electrics. You may be surprised how much opportunity there is to actually fence. If you’re booking your own flights, return on the Friday, not the Thursday. The course ends with a dinner where diplomas are awarded. Due to some communication errors, I came back on the Thursday and had to ask someone to bring my diploma for me. Make friends, go out. There are a few excursions organised, but you’ll make some of the best bonds by going out in the evening for a few drinks. If you’re in Budapest, go to the ruin pubs. They’re awesome. Record everything. Notes are good, video is good, both is better. Don’t be afraid to ask questions. You will get stuff wrong. It’s a learning experience. Don’t turn up hungover the following morning. If you do turn up hungover, expect the warm up to hurt. Expect others to point and laugh. Don’t worry too much about cash. Almost everything is paid for. You only need spending money.